Structural and Mechanistic Enzymology, Volume 109, the latest release in the Advances in Protein Chemistry and Structural Biology series, is an essential resource for protein chemists. 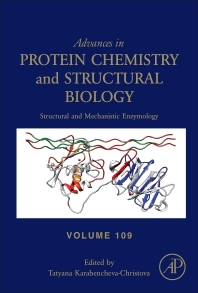 Chapters in this new volume include Collagenolytic Matrix Metalloproteinase Structure–Function Relationships: Insights from Molecular Dynamics Studies, Computational Glycobiology: Mechanistic Studies of Carbohydrate-Active Enzymes and Implication for Inhibitor Design, Computational Biochemistry─Enzyme Mechanisms Explored, and A Paradigm for C─H Bond Cleavage: Structural and Functional Aspects of Transition State Stabilization by Mandelate Racemase. This series presents new information on protocols and analysis of proteins, with each volume guest edited by leading experts in a broad range of protein-related topics. This volume presents state-of-the-art contributions, providing insights into the relationship between enzyme structure, catalysis, and function. Dr. Tatyana Karabencheva-Christova works at the Department of Applied Sciences, University of Northumbria, UK.